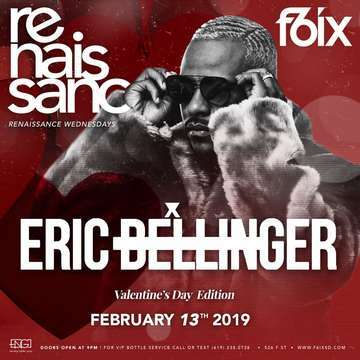 318 Media Group and Pro Management presents Eric Bellinger, up Close and Performance Pre Valentine's Performance at F6ix. Best known for his club bangers “I Don’t Want Her” and “Valet,” singer-songwriter (and sometimes rapper) Eric Bellinger prides himself on quality, authenticity and passion in not only his music but his everyday life. Having traveled the world tearing down stages across all major cities and clubs, the 32-year-old hasn't forgotten his Compton roots. Having entered the industry as a songwriter and producer — which led to a Grammy win for Chris Brown's F.A.M.E. in 2014 — it was his debut effort, The Rebirth, that secured his place as a solo R&B singer, mixing the nuances of ’90s soul and contemporary production. Fast-forward to 2018 and he has unleashed his fourth studio album, Eazy Call, showcasing his versatility in catering to both older and newer generations alike.